John Martin on tenor and soprano sax, Tim Fairhall on double bass, Andy Ball on drums and Jonjo Grisdale on piano. 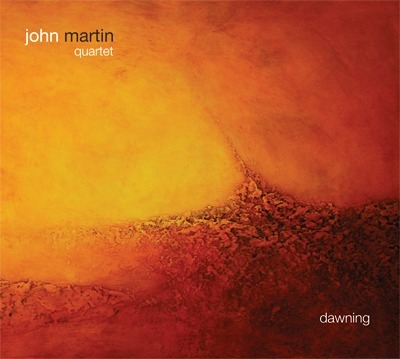 ‘Dawning’ is the debut album from the John Martin Quartet and reveals a young saxophonist/composer with a warm and engaging voice. The eight original tracks (all by Martin) that make up the album have a strong sense of melody with thoughtful interplay between the composed elements and the supple improvisations of the Quartet. After studying composition with Nikki Iles and Eddie Parker at Middlesex University, John Martin went on to play as a sideman in many bands on both the jazz and world music scenes. During this time he worked hard on developing his own sound, studying the masters of the music and immersing himself in the rich cultural diversity that the many different London music scenes have to offer. to buy the album click the buy now button at the top left of the screen. 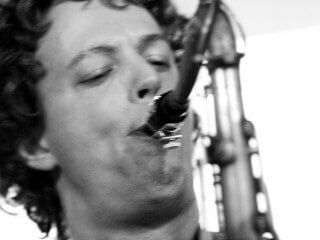 John Martin (Tenor and soprano sax) After studying composition with Nikki Iles and Eddie Parker at Middlesex University, John went on to play as a sideman in many bands on both the jazz and world music scenes. During this time john has regularly performed in top London venues such as the Jazz Café, Pizza Express (Dean St) and the Vortex, as well as at many festivals both here and abroad. He has played with the salsa king Roberto Pla, Fela Kuti’s keyboard player Dele Sosimi, Italian guitar maestro Georgio Serci and the award-winning singer Liane Carrol. John also played on Guillemots Mercury Prize nominated album ‘Through The Window Pane’, and has recently recorded three other albums – two as a sideman, with the Root Source and Metamorphic, and Dawning’, his first as a leader. 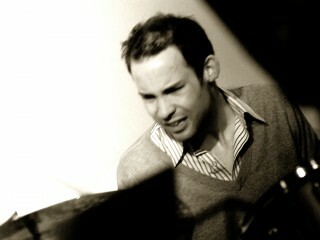 Born into a musical family, Andy began to play the drums at the age of six. 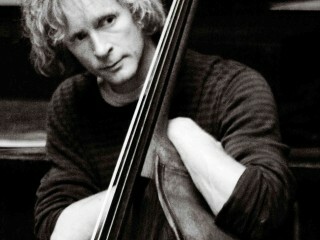 He studied jazz at Leeds College of Music, followed by a Master’s degree at the Royal Academy. He has performed with many of Britain’s most prominent musicians including Gerard Presencer, Stan Sulzman, Kenny Wheeler, John Taylor, Tim Garland, Alex Garnett, Brandon Allen, Neil Yates and Dennis Rollins. Having studied philosophy at Cambridge University, Tim went on to graduate with distinction from the Master’s course at the Guildhall School of Music and Drama. He has performed at many venues including the Royal Festival Hall, the Vortex, the Royal Albert Hall and the 606 Club, and with players including Martin Speake, Cleveland Watkiss, Nikki Iles and Stan Sulzmann. He has recently been touring worldwide with Yasmin Levy. Jonjo started learning the piano at the age of 7. 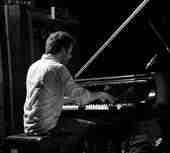 He also studied jazz at Middlesex University, graduating with a 1st class degree in 2007. Since leaving university Jonjo has become in demand as a session musician, playing and touring with the likes of Roger Waters, David Gilmour, Lauren Pritchard, Tom Jones, Sophie Ellis-Bextor, Nick Cave, Lily Allen, Shane McGowan, and Suggs. He has just finished co-writing his first pop album, working with producer Hugh Harris and singer Luke Allen; and writes and plays in the band Modern Breakfast with guitarist Chester Kamen.